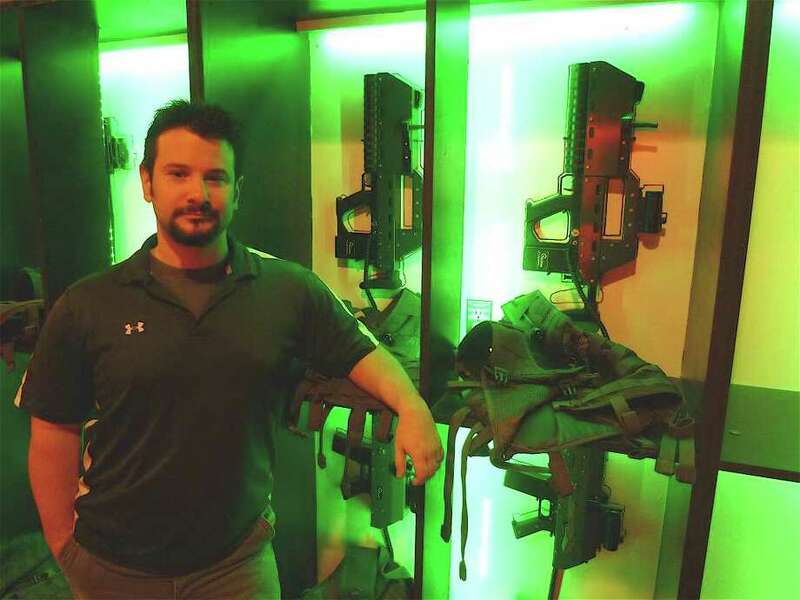 Keith DiBuono, owner of First Person Sports, stands beside a rack containing mesh military-style vests and AK-47 tagger guns that rely on infrared light technology for the gamer business in Fairfield. Armed with AK-47s, the squad split into two and fanned out. Three guys crept right, making their way around cement barriers, looking through their gun sights, index fingers ready to squeeze off a round. Meanwhile, three guys crouched and headed left, stealthily darting from one point of coverage to another. Suddenly, a flurry of shots rang out and someone cried, "Casualty!" Man down ... but, surprisingly, not out. This was a simulation, after all, of a firefighter between opposing teams of commandos in a post-apocalyptic abandoned airport terminal setting. And the firearms rely on infrared light technology instead of live ammo. Most surprising, the terminal sits in the middle of Fairfield. All this action -- and more -- typifies the offerings at First Person Sports in its 4,200-square-foot arena at the Sportsplex, 85 Mill Plain Road. Opened last May, the facility is drawing teens, young adults, dates, families and party groups eager to experience "virtual" combat and video games from a first-person perspective. Owner Keith DiBuono, 35, established the business as a mobile enterprise in Westchester County in 2008. While the physical combat activity doesn't employ lasers, it is popularly referred to as Laser Skirmish. Wearing military-grade tactical hydration vests, opponents aim high-tech weapons at each other and fire off shots with the goal of scoring hits on one of three sensors -- one on the tagger gun itself, two on a player's vest. Overall registered hits are tracked to determine which team is the winner in a battle. Rounds last around 10 to 15 minutes, and limits are set on ammo and "lives." DiBuono's brother-in-law, who was attending the University of Central Florida at the time, first played a version of Skirmish in Orlando, and suggested to Keith that he start a similar business in the Northeast. DiBuono was working for a party facilitator as a costumed Elmo muppet character and wanted to break out on his own. The type of laser gameplay that most people are familiar with is Laser Tag. It's often played in a darkened room with neon vests, rudimentary weapons and a scoreboard. Laser Skirmish takes the experience to the next level with more sophisticated equipment, can be taken outside, and has a long range -- the smallest guns can tag up to 300 feet; larger guns up to 600 feet. DiBuono works with a distributor in Australia, one of only two manufacturers in the world that make the type of advanced equipment they use, DiBuono claims. In its initial mobile form, First Person brought the weaponry and inflatable "speed" and "deluxe" field obstacles directly to customers. This would often be teens celebrating birthdays and looking to live out action movie fantasies or combat video game scenarios. As developer Hal Fischel was expanding Sportsplex -- previously, a longtime factory site -- he reached out to DiBuono and invited the young entrepreneur to become a tenant. First Person made a good fit in a facility menu of businesses that already included rock climbing, archery, indoor skating and gymnastics. In addition to the combat arena, First Person's space includes a game lounge with modern couches, five monitors -- four 42-inch LG's and one 82-inch Mitsubishi rear-projection screen -- and Xbox 360 game systems that play over 75 video game titles including Halo Reach and Call of Duty. DiBuono designed the facility himself, including the arena and its features, which incorporate concrete, sheetrock and plywood, based on a battle mission setting. "I wanted to create a more immersive, multi-player battle experience like `Call of Duty,' " the most popular game among first-person simulations, in which a player navigates a fight from the perspective of the soldier, staring right down the barrel of the gun and through the gun sight. DiBuono has been a long-time gamer. "I started with Atari, went to Sega, Genesis, Nintendo, Nintendo 64, Playstation, Playstation 2, then Xbox," he said. "My brother, Eric, is a video game collector who owns every system that's been put on the market. He just graduated from Fullsail University, in Orlando, which is basically a media university -- music and film to video game design and modeling. He earned a degree in 3-D modeling and just finished rotoscoping the movie Captain America, taking frame-by-frame video footage and converting it to 3-D."
As to his family, DiBuono said, "My folks are very happy with what the business has become. I'm the first generation to spread my wings as an entrepreneur. This is the only facility of its kind in Connecticut, and the only facility in New England that has gone to this extent. We're on the leading edge of this technology and I've thrown myself in completely. There are only 50 fields across the U.S. that use our level of equipment." DiBuono said Laser Skirmish is still relatively new. "It's starting to roll out and become more popular and video game industries are learning about our equipment. It's the future of the business." First Person Sports is located in the Sportsplex at 85 Mill Plain Road. For more information, pricing and/or membership packages, call 1-888-FPS-1337 or visit www.firstpersonsports.com online.